My little boy can be quite fussy with his food but never think twice rejecting anything with chocolate, sweets and... corn! - Lucky me? 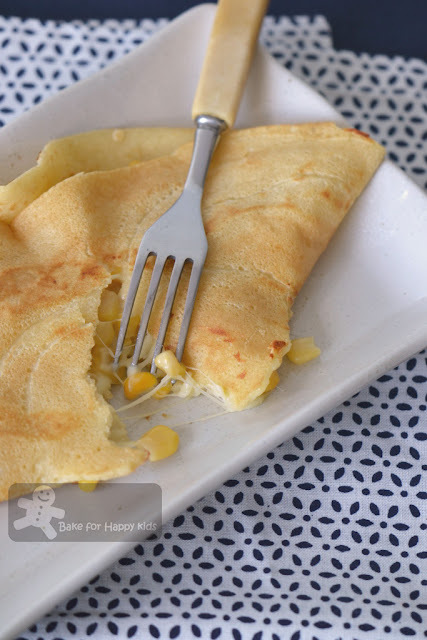 My son and I have been doing lots of "kiddy-cooking" lately and here are two different pancakes that we have created using corn and cheese as our main ingredients in our "play-kitchen". My son and I really enjoyed eating both versions of pancakes that we have created but our big boss daddy was a little disappointed when he first saw these pancakes and asked "where is the meat?" - LOL! The first recipe that we have used is mainly adapted from shrove Tuesday pancakes by Nigella Lawson, published in her book, Feast. In Feast, Nigella wrote that we can eat these pancakes with sugar plus lemon or Nutella but we ate ours with buttered corn and melted mozzarella cheese - Yum! 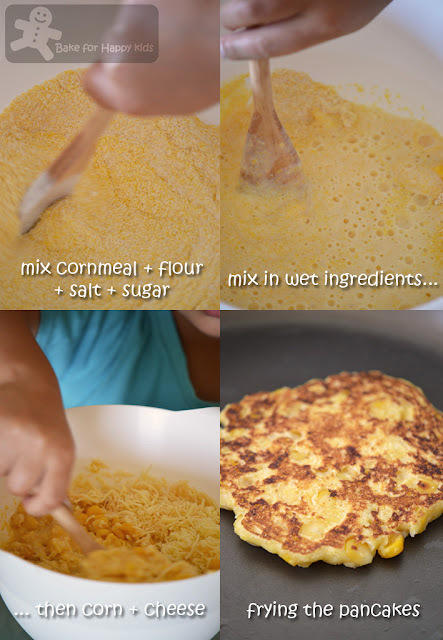 The second recipe is mainly adapted from a corn cake recipe from Epicurious. 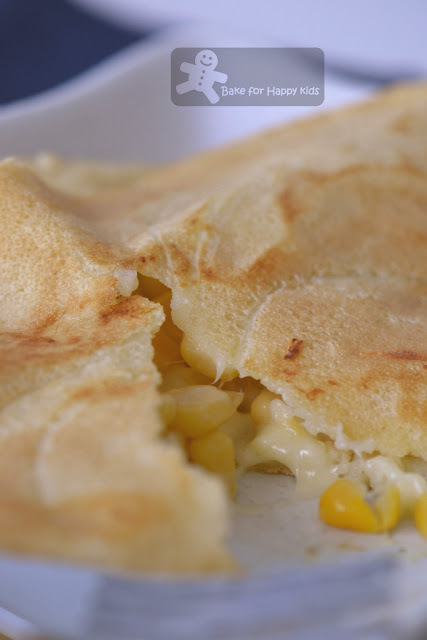 The original recipe adds corns, cheese, onion, red pepper and chilli into the pancakes but we only like our version being plain with corns and cheese. Nothing more and less - just corns and cheese! Mix, mix, mix and fry! These warm pancakes have nice spongy cheesy texture. Melt butter and let cool a little. 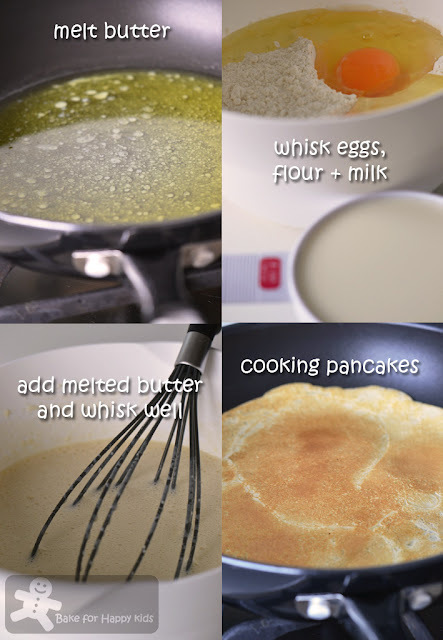 Pour flour into a bowl, whisk in the egg and milk and finally just before making the crepes, mix in the melted butter. Note: Mixture can be lumpy. You can whiz mixture in a blender or pour mixture through a sieve and press any lumps through the sieve. Heat a pan and ladle 2-3 tablespoons of batter into the pan and quickly swirl so that the batter forms a think pancake. Cook for a min and flip it and cook for 30 secs to a minute on the other side. Remove the crepe to a layer of baking paper. Continue with the rest of the batter. Note: Using double amount of this recipe and a 26 cm pan, I have made 9 pancakes. Sauté corn, melted butter and salt together until lightly fragrant. Set aside. 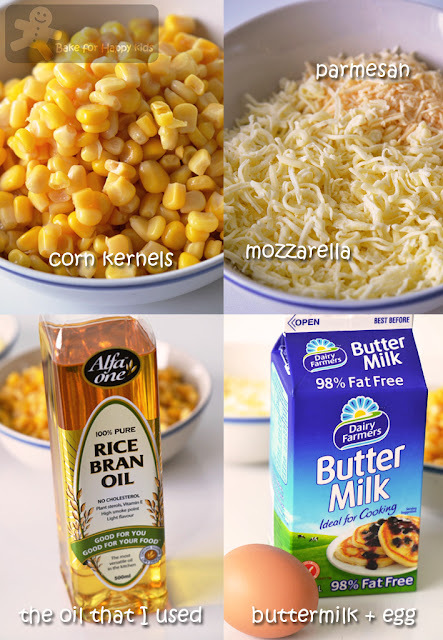 On a heated pan, place one pancake first, a small handful of mozzarella cheese, then 2 tbsp of buttery corn. 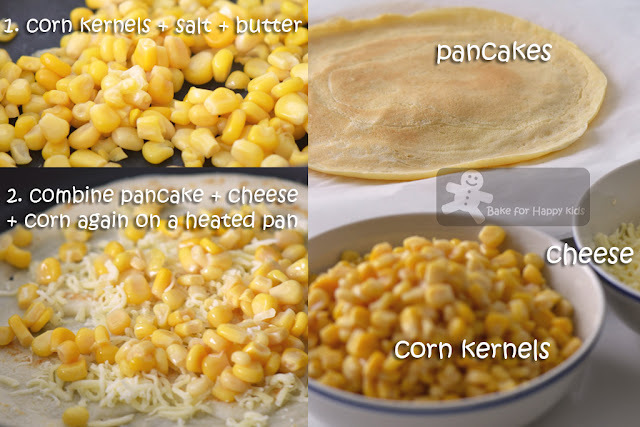 Cook until the cheese begin to melt and flip the pancake into half. Remove pancake from the pan and enjoy them while they are warm with gooey inside. Repeat with the rest. In a bowl, whisk together cornmeal, flour, salt, baking soda (or baking powder), pepper (I didn't add this) and the sugar. In another bowl whisk together 2 tbsp of butter (or oil), egg, and buttermilk. Stir in corn, onion, roasted pepper, chilli, (I didn't add onion, pepper and chilli) and cheese, and stir in the cornmeal mixture, stirring until the batter is just combined. Heat a griddle over moderately high heat until it is hot, brush it lightly with the additional butter (or oil), and working in batches drop the batter by a 1/4-cup measure onto the griddle. Spread the batter slightly to form 3 1/2- to 4-inch cakes, cook the cakes for 2 to 3 mins on each side, or until they are golden, transferring them as they are cooked to a heatproof platter, and keep them warm. Note: With this amount of batter, 1/4 cupful of batter can yield approximately 12 pancakes. They are great to be served on their own or with mayonnaise. Ooh, how cheesy and delicious! These corn pancakes look really good. My kids who love corn would enjoy this too. 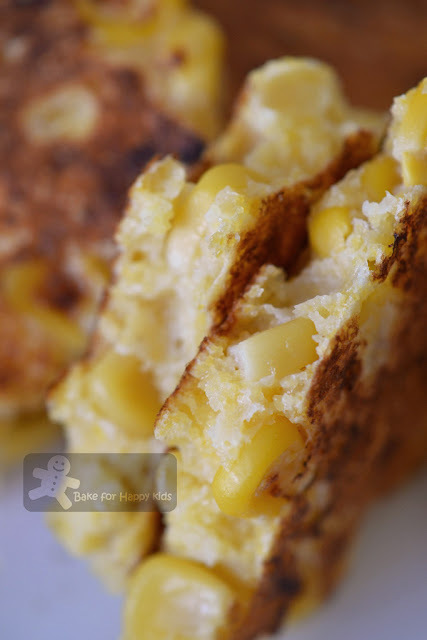 Hi Zoe, welcome back :) These corn pancakes look cheesy and soft, they must be tasty. Great that you have lot of fun with your kids in kitchen. I like that these are kind of crepe-y. It looks very yummy. I will definitely try to make it one day. We didn't have a complied list of events and probably do the list after organizing more than 10 events and when the list get longer. Cheers! 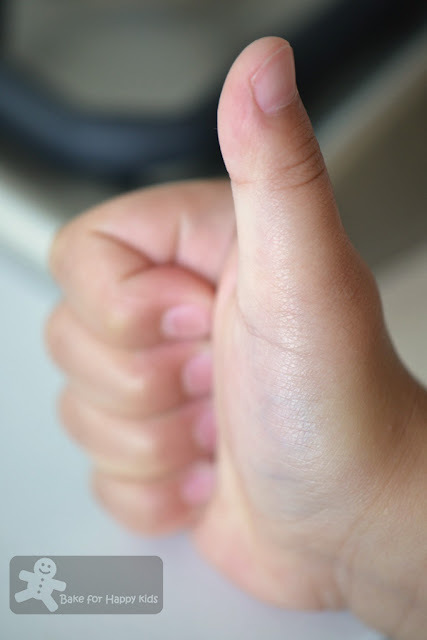 Love the thumb! Sooo cute!